I was asked how I got these shots. All of these shots were taken with a Nikon D90 with 50mm f1.8D lens. Manual exposure mode 1/100th of a second at f1.8. Pictures like this are a challenge because the lights are easy to see but, if you allow the automation to select your exposure you end up with muddy pictures or, end up with such a slow shutter speed that subject motion turns all your lights into streaks. Since these are all boats in motion, their wakes make the water a little choppy and the motion can be multi-dimensional. So, I increased my shutter speed to 1/100 and opened the lens up to it’s maximum aperture. 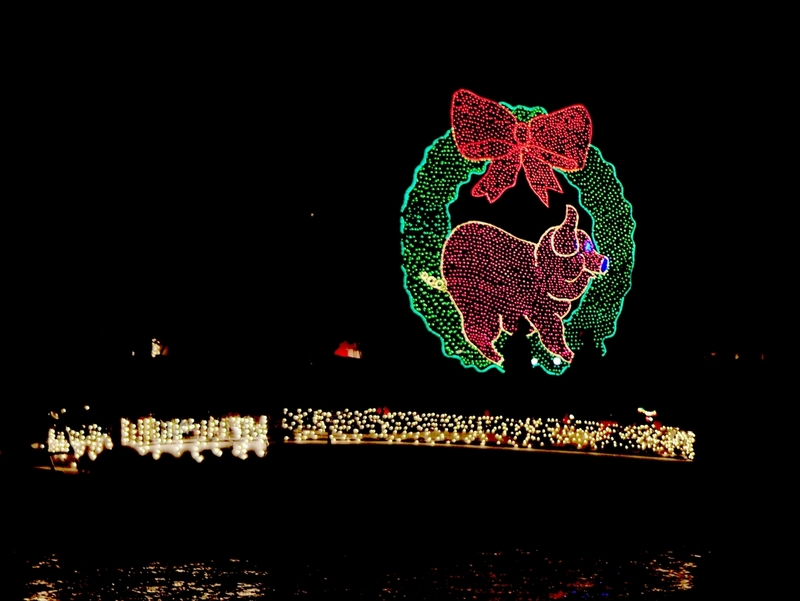 That got the lights in focus and stopped but, still left the picture underexposed. 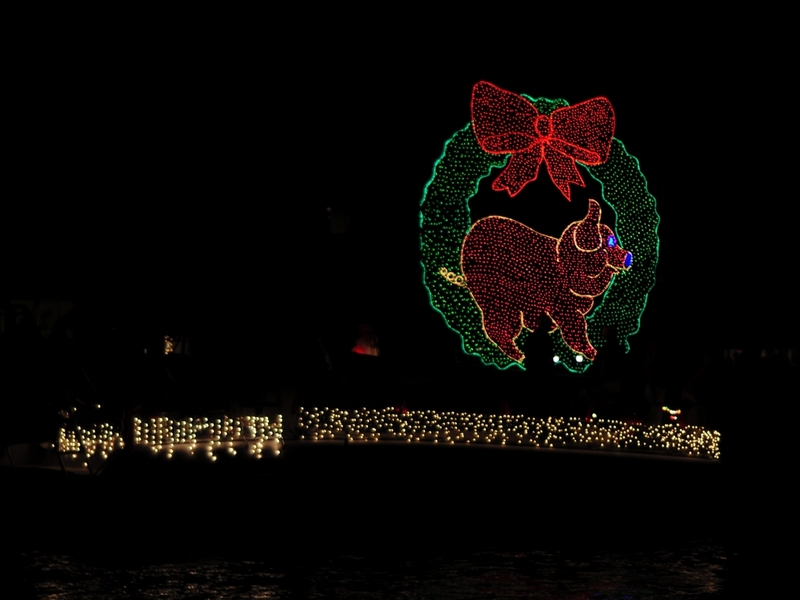 Here is a straight from the camera jpeg of the Pig Wreath above. Post processing was enlightening. Normally, brightness and contrast are enough to adjust exposure. These are linear function though and as a result you start getting a lot of grey coming into the dark parts of the picture. I then remembered that Gamma correction is non-linear and tried that using the free Faststone image viewer which includes some decent editting functions for quick fixes including an ‘enhance color’ function. Increasing Gamma quickly added some brilliance to the lights and kept the dark areas clean. Your photos are great. I live in Port Charlotte, I am a sailor, and have just acquired A Cannon SX30IS. I am a beginner, and signed up for a class in Jan. at the Cultural Center. I’m hoping some day to take photos as well as yours. I want to photograph different things, and places, especially out on the water. 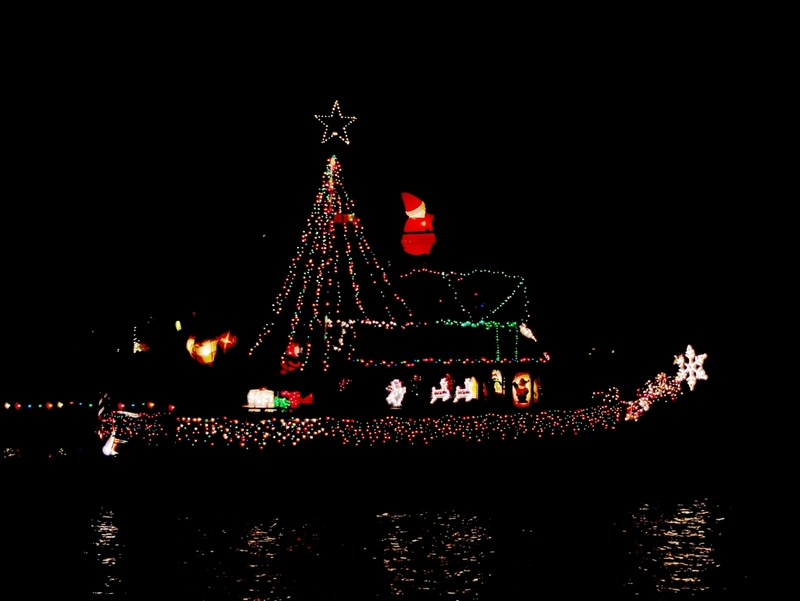 I also took photos of the lighted boat parade with with a Sony Sure shot.. If you are interested in learning more about photography in a friendly atmosphere, follow the link on the right side of the blog to the Photo Adventures Camera Club.